Dive Travel Services partners with the top liveaboards in the world to bring you the best and most exciting diving adventures. For more information, current specials, updated availability or to book a trip, contact Janet at 248-442-2772 or at trips@divetravelservices.com. Aggressor Fleet yachts span the globe with 10 dive yachts in 11 different countries and the list of exotic destinations keeps growing. The dive yachts continue to feature the finest creature comforts such as DVD players in the staterooms, rental digital cameras, video editing centers, onboard computers and satellite communications. From the schooling hammerheads in Galapagos to the whale sharks in Utila, Aggressor Fleet has an excursion that will suit your appetite for adventure and your vacation budget. Every destination, itinerary, and dive site is carefully selected. Moorings are delicately put in place to preserve the reefs and marine environment for future generations. All Aggressor yachts comply with Eco-operator guidelines. Amira was built with locally grown timber by indigenous crafts men using ancient Pinisi boat building traditions. She is equipped with a state of the art navigation system, security and rescue equipment and technology. The 52-meter-long Amira offers 8 comfortable double cabins and two single cabins, all equipped with personal showers and toilets and natural lighting. There is a cozy restaurant, a romantic lounge area, a huge sun deck and a dive boat. Aqua Cat Cruises offers a leisurely liveaboard scuba diving and snorkeling adventure vacation in the Bahamas aboard the 102-foot Aqua Cat catamaran. Each week we cruise from Nassau, Bahamas to the remote islands of the Exumas, and the Exuma Cays Land and Sea Park, the most pristine area in all the Bahamas. The Aqua Cat, offers luxury accommodations, a spacious main salon and an extremely smooth ride. Her ability to cruise at a speed of 14-knots will get you to dive sites quickly while her 35-ft beam will ensure a smooth ride. The eleven passenger cabins are some of the largest of any liveaboard in the world. The 43-meter Arenui dive liveaboard is a traditional and magnificent Phinisi, a classic Indonesian wooden sailing vessel, made to explore the majestic underwater world of the Indonesian archipelago. The underlying concept of the Arenui is to provide you with the convenience of a fully equipped dive liveaboard together with all the richness, artistic touches and comforts of a top-notch luxury boutique hotel. Yet this is the only one that drops you off directly onto the best dive sites that Indonesia has to offer! To showcase the best of Indonesia, we spend the May to October months mainly around the Komodo National Park area, taking in dive sites and landscapes from Bali right across to Flores and Alor. In November ,we move toward Ambon in Maluku and the Spice Islands in the Banda Sea, working our way to the Raja Ampat area of Western Papua to continue dive cruises from December through until April. The Arenui has been designed to host a maximum of 16 passengers in cabins which are exceptionally spacious (starting from 17 square meters) and which have been luxuriously furnished in a sophisticated and tasteful manner. The cabins' individual themes and styles were inspired by handicrafts from each of the Indonesian provinces. Each one has a private en-suite bathroom and individual air conditioning. Explore the Philippines aboard the 107-foot-long Atlantis Azores. The Azores has seven deluxe staterooms - with double and single berths, lavatory, hairdryer, private head and shower. All situated below decks. Our suite is located on the upper deck and also has a double and single berth, as well as a desk and window. January through to mid-March is whaleshark season in Southern Leyte; enjoy unrivaled snorkeling action with these gentle giants. Tubbataha is our most popular season running from mid March through to early June. Dumaguete is our base for the summer months of June through to September and our Visayas Safari is a unique opportunity to take in several beautiful islands in one week. We spend October through December based out of Puerto Galera exploring Anilao, and Apo Reef on the west coast of Mindoro. The 40-meter, steel-hulled, twin-engined MV Black Manta, build in 2006, is operated by White Manta Diving, based in Singapore. There are eight en-suite cabins and two standard cabins, all air conditioned. Services on board include a Nitrox membrane system, 10 sets of full dive gear, two masseuses, Nespresso coffee-making machine, housekeeping and laundry, as well as personal sea-safe tracking devices. Meals onboard are mainly Indonesian and Western fare served buffet-style. 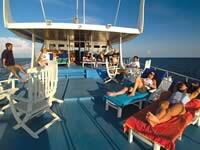 Blackbeard's Cruises offers liveaboard scuba diving adventure travel vacations to the Out Islands of the Bahamas. Reef, wreck, wall, drift, night and shark dives are offered on each trip. Our three sailboats - Sea Explorer, Morning Star and Pirate's Lady - offer Caribbean diving and snorkeling cruises to the Out Islands of the Western Bahamas. Our liveaboards accommodate singles and couples in 4 air-conditioned cabin areas. Berths are single upper and lower, or double upper and lower, each with its own privacy curtain similar to a sleeperette on a train. 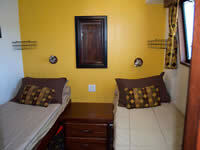 We do not have private accommodations, all berths are dormitory style. 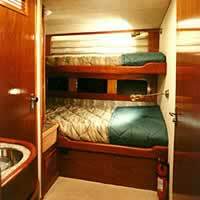 Berths are 74" in length, with doubles 48" wide and singles 24" to 36" wide. An experience of a lifetime awaits you onboard the magnificent Blue Manta. Stable, spacious and safe, the Blue Manta is fully equipped to take you on a fascinating diving adventure in the magical waters of Indonesia. The Blue Manta is operated by White Manta Diving, based in Singapore. The Blue Manta is possibly the largest purpose-built dive vessel in the region. 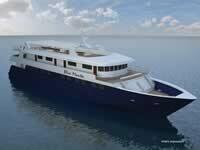 Measuring 45m (148 ft) by 9m (29ft), this steel hull vessel will only take 16 guests. The 14 beautifully furnished, en-suite cabins, each average 20sqm (200sf) in size. There's an open outdoor alfresco dining area and an indoor air-conditioned room for finer dining. With maximum comfort and safety in mind, the Blue Manta is well equipped with safety facilities, cruises at 10 knots and the steel hull makes her an ideal vessel for long haul cruises and blue water crossing trips. The M/V Caribbean Pearl II is based out of Utila, Honduras, the smallest of the Bay Islands of Honduras, and is operated by Bay Islands Yacht Charters. Accommodations include one Master Cabin and eight Deluxe Cabins. The Master Cabin has a queen bed, individual climate control, private head and shower, and a hair dryer. All the Deluxe Cabins have a double bed, a single bunk, individual climate control, private head and shower and a hair dryer. Balmy waters and excellent visibility keep diving conditions ideal throughout the year. Water temperature ranges from 86 F in September to 78 F in January. One can frequently view pelagics from over 100 feet away. Currents tend to be mild and relaxing. From spellbinding and mystical caverns, intriguing wrecks, majestic walls, atolls, and white sandy bottoms, to swimming with Whale Sharks and Caribbean Reef Sharks, diving in the Bay Islands is unsurpassed in the Caribbean. The M/V Carpe Vita Explorer began service in February 2011 and is a very luxurious addition to the Explorer Ventures Fleet. This 20-passenger, 125-foot wooden-hull safari yacht, along with her 61-foot custom matching dhoni (dive tender), was built by one of the Maldives most accomplished boat builders. It provides guests with an exceptional and luxurious yachting experience, large, hotel-style staterooms, hot tub and unmatched open-air comfort! All 10 cabins offer a private bath and shower, separately controlled air-conditioning and plenty of storage space. The 2 upper deck cabins are very large with a king bed or double beds and study area; the 2 main deck cabins can accommodate 2 individual with 2 double beds or a couple in 1 queen; the 6 lower deck cabins offer a queen bed and a twin bed. The reefs of the Maldives are teeming with life and divers encounter many different species found in few other places. There are lion fish, anemone fish, octopus as well as many species of moray eels. The Maldives are also known for the big animals. Whale sharks, mantas, and dolphins are often seen and sea turtles are seen on almost every dive. The world's most exotic diving destination has a new attraction. The MV Chertan is a purpose-built dive boat that has begun operations out of Alotau in Milne Bay. The Chertan introduces a term many intrepid divers are unfamiliar with - luxury. 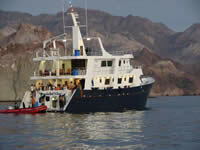 The 60-foot long MV Chertan has accommodations for 10 passengers in 5 staterooms. A cruise on Chertan offers unlimited diving for the enthusiast as well as an introduction to the local culture. Our itineraries are all about adventure, challenge and discovery in conditions that few have experienced. From dugouts to dugongs, from plunging coral drop-offs to towering volcanic mountains, skull caves and thermal springs, from hammerhead sharks to manta rays, the region is truly unique. Choose from eight thrilling destinations with the Dancer Fleet for the liveaboard experience of a lifetime. On a Dancer Fleet� Liveaboard vacation, luxury features and topnotch amenities, plus attention to every detail will make you feel as pampered as an invited guest on a private yacht. The unique Wind Dancer itinerary covers the territorial waters of two countries: Grenada and St. Vincent and the Grenadines, as well as Cocos Island. This itinerary has it all � warm, clear water, beautiful reefs, great marine life, and some truly amazing wrecks. Galapagos Sky cruises the Galapagos Islands following a planned itinerary that is approved by the Galapagos National Park and includes visits to the very remote islands of Wolf and Darwin. You'll encounter sea lions, penguins, giant mantas, golden rays, and a variety of sharks including schooling hammerhead sharks. Sun Dancer II visits atolls that lie offshore beyond Belize's barrier reef. The most famous of the atolls is Lighthouse Reef, home of the Blue Hole and the magnificent nature preserve at Half Moon Caye. You can expect visibility to reach 120 feet or more at these spectacular sites. The walls and drop-offs are dramatic. The reef, virgin and pristine, is home to a stunning variety of fish and coral. Komodo Dancer offers diving in the Komodo National Park, Sangeang and Bima with special trips east of the park where you'll explore from Flores to Alor for worldclass critter diving. The park is home to more than 1,000 species of fish, 385 species of reef building corals, 70 species of sponges, 10 dolphin species, six whale species, giant sea turtles, dugongs, and various species of sharks and rays. Ocean Dancer offers a tremendous variety of diving encounters in the Maldives. Currents and tides flush water through the channels of the atolls, carrying with them nutrients and plankton.This gives Maldives' diving a character all its own. Bula! Known as the soft coral capital, Fiji dazzles everyone with its bright corals and huge sea fans surrounded by clownfish, ornate ghost pipefish and nudibranchs. But it does not stop there. Fiji also comes with schooling pelagics. Make sure you turn from the bright corals and look for barracuda, reef sharks, mantas, tuna and the occasional pilot whale! There is no shortage of marine life large and small in the waters of Fiji. Experience Fiji aboard the Island Dancer II. Explore the Palua archipelago in Micronesia aboard the M/Y Tropic Dancer. Get ready to enjoy the thrill of drift diving with schooling sharks, the beauty of healthy hard and soft corals, the tranquility of Jellyfish Lake, the historic WWII wrecks and the vibrant fish life that all make up the diving in this grand place. Aboard the Carib Dancer guests will depart Nassau to explore the dramatic walls, lush coral reefs and exciting animal encounters of the Exuma Cays Land and Sea Park. This protected area is one of the world's most successful marine parks with an area of 176 square miles consisting of an array of more than 350 small islands and cays. Waters are thick with coral reefs that are alive with every imaginable ocean critter from the living jewels � angelfish and butterfly fish � to the charismatic food-chain toppers like grouper and barracuda � right down to the tiniest living invertebrates. Night diving allows guests to experience an entirely different group of critters and bevy of behaviors not visible during the day. Living aboard Dewi Nusantara is as close to a five-star experience as is possible in the faraway corners of the Indonesian archipelago. 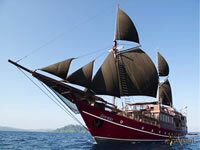 Dewi Nusantara offers dive cruises to Komodo National Park, Raja Ampat, Banda Sea, Ambon, Halmahera and Cenderawasih Bay. With an overall length of 57 meters, our three-masted topsail schooner moves with a grace and stability that only larger sailing vessels can offer. 2000 square meters of sail are complemented by two 500 horsepower marine engines and two desalinators that each produce 5000 liters of fresh water per day. We purposely designed the Goddess of the Archipelago to be totally independent for long periods at sea while offering unparalleled comfort. There are eight spacious air-conditioned staterooms, that can be adapted to either twin or double use, each with its own en suite bathroom. The master and commanders' cabin aft is the size of a large hotel suite. Dive-Damai boutique liveaboards -- Damai I and Damai II -- are dedicated to small groups and offer the chance to enjoy diving remote areas in Indonesia, while experiencing unprecedented service and an unlimited amount of dives and bottom time. Gourmet food, exceptional service and the best reefs all for you with a 3 divers per guide ratio. "Damai" is an Indonesian word meaning "peaceful", and perfectly reflects our vision, providing tranquility above the water while avoiding crowds down below. The MSY Damai I, with four luxurious cabins, it is designed to offer that personal service that only a boutique liveaboard dedicated to small groups can provide. The cabins are well over 30 square meters each, coming with either queen or king sized beds, separated ensuite toiletts and showers/bath tubs. The 40-meter MSY Damai II was built to an uncompromising standard and fitted out with all the latest diving, navigation and safety equipment. Each cabin boasts a private shower and head with a queen-size bed and a separate day bed. The cabins measure approximately 20sq.mts (225 sq.ft) each and are finished with the highest quality furnishings. The stern staterooms are over 400 sq.ft each and boast their own private deck with loungers, a super-king size bed, day beds, two desks and ensuite shower and separate head. Explorer Adventures operates a fleet of three vessels. Caribbean Explorer II is a 115-foot, 18-passenger vessel and accommodates guests in 9 air-conditioned double staterooms on the main and lower deck. Each stateroom has a private bathroom and shower. The upper deck contains a semi-enclosed dining and entertainment area. The open rear sundeck is furnished with lounges for sunbathing or relaxing. The Caribbean Explorer II spends half the year providing diving excursions in the northeastern Caribbean, and the other half in the southern Bahamas. Explorer Ventures' Humboldt Explorer, named for the oceanic current that brings the diverse species to the Galapagos Islands, is one of only a few liveaboard diving vessels in operation in the Galapagos Islands. The Humboldt Explorer is a 100-foot vessel with 8 large, comfortable staterooms on the main and upper decks, and will be capable of accessing the remote islands of Darwin and Wolf in significantly less time than other vessels. Designed by the same architect and designer that created our previous vessel, each stateroom will contain two twin beds which can be converted to one large bed; there will be ample closet space in each room, as well as large windows to view the spectacular scenery and unique wildlife found in these islands. The vessel's interior touts gleaming hardwood floors and a spacious eating and lounge area; a large sundeck and outdoor lounge will also be available for privileged guests. The 124-foot M/V Turks & Caicos Explorer II accommodates 20 passengers in 10 double staterooms, each of which have private bathroom facilities, individually-controlled air conditioning, hanging closet and wardrobe. The air-conditioned main salon on the main deck includes dining tables, TV, VCR, CD/DVD, video library and lounge area. A large sundeck with lounge chairs and buffet area is located aft of the upstairs deckhouse. A large, awning-covered flybridge with wet bar, barbecue and seating for 12 to 15 is accessed from the sun deck as well. 8-day/7-night itineraries. The M/V Carpe Vita Explorer began service in February 2011 in the Maldives and is a very luxurious addition to the Explorer Ventures Fleet. This 20-passenger, 125-foot wooden-hull safari yacht, along with her 61-foot custom matching dhoni (dive tender), was built by one of the Maldives most accomplished boat builders. It provides guests with an exceptional and luxurious yachting experience, large, hotel-style staterooms, hot tub and unmatched open-air comfort! MV FeBrina is a boutique, traditional style live aboard operating in Papua New Guinea water since 1991 when she arrived at Walindi Resort. The quality diving experience MV FeBrina offers can be quantified by the high number of repeat clientele she enjoys. The crew on MV FeBrina are some of the most experienced in Papua New Guinea, most having been with us for many years. The M.V. FeBrina dives the areas of Kimbe Bay and surrounding waters along the northern coast of New Britain, such as the Witu Islands to the north west and Fathers Reefs to the north east of Kimbe Bay. These waters are home to prolific and diverse marine creatures and corals. Recent marine surveys in Kimbe Bay have recorded over 350 species of reef building corals and over 900 species of fish. The reefs are a photographer's paradise. Pristine and colorful corals are home to a variety of fish, crustacean and invertebrate life. Many of the reefs have resident schools of barracuda, tuna, and jacks. A range of shark species are regularly sighted, including hammerheads and silvertips, particularly at the outer reefs of Fathers and Witu. Visibility ranges from 80 to 150 feet, depending on the season and water temperatures range between 85 and 90 degrees Fahrenheit. Weather is tropical with little seasonal variation. The 72-foot long MV FeBrina has seven cabins with accommodations for up to 12 passengers, including 2 smaller single cabins. Below Deck Cabins are ensuite with individually controlled air conditioning. Most diving is from FeBrina's spacious dive deck, with easy access via the water level dive platform. Meals are provided by our experienced galley staff and are fresh and plentiful with lots of delicious snacks in between dives. The 40-metre S/Y Fiji Siren luxury kiveaboard is the newest member of our liveaboard fleet, first launched in September 2013. The 8 large, air-conditioned cabins each have their own personal audio-visual entertainment system and ensuite bathrooms with hot water through adjustable electric heaters.The cabins used as twin or double bedded rooms. The outdoor dining area is very comfortable and provides a fabulous setting for all your meals. The dive deck is perhaps the most spacious and convenient you would have experienced. Designated areas for charging and preparation of your camera and video equipment can be found inside the main lounge - the S/Y Fiji Siren truly sets out to be the pros choice for underwater photography and videography. We offer you the chance to visit some of Fiji's most highly rated dive sites in one superb itinerary. Fiji is known for its stunning soft corals but divers here can also expect to see a variety of sharks and rays, schools of fish and plenty of smaller creatures. Aboard the S/Y Fiji Siren we welcome up to a maximum of 16 divers on each trip. This ensures abundant space for all guests. Built of steel and providing a cruising speed of 10 knots, the French Polynesia Master is the newest liveaboard to ply the waters of this island archipelago, welcoming aboard 20 guests for 7- or 10-night dive safaris. Our 3 decks provide ample space for relaxation and dive equipment and camera preparation. On a typical day aboard the French Polynesia Master, we offer up to 4 day dives, however, the 4th day dive may be substituted for a night dive when the boat is anchored within a sheltered cove. A 7-night itinerary provides between 18-20 dives, while during our 10-night itineraries, up to 30 dives will be possible. Our diving itineraries take you through the Tuamotu Island chain, from Rangiroa to Fakarav, with a choice of 7- or 10-night safaris between these two hot spots, as well as a Fakarava-Fakarava 7-night loop which maximises the time spent in this area. Diving Papua New Guinea on the elegant liveaboard MV Golden Dawn offers the finest dive sites and diving in Papua New Guinea. PNG dive itineraries include the Eastern Fields in the Coral Sea, Milne Bay and Northern PNG, Wewalk. Wreck diving and technical diving opportunities abound with nitrox and rebreathers aboard. Trips to the Eastern Fields/Coral Sea operate November through to December and April through to May - prime time for this area. On these cruises, you will find the waters of the barrier reef system around Port Moresby teem with beautiful flora and fauna to satisfy the keenest sports diver or the most dedicated underwater photographer, with Mantas, Sharks and Turtles. Divers have encountered the rare Great hammerhead as well as his smaller Scalloped brothers and Whale Sharks are sighted annually as far in as the capital's main harbour! The more exotic treats include the Lacy Scorpion fish (Rhinopias aphanes and his rarer brother R. fondoza), Leaf Scorpion fish, Stone and False Stonefish, Crocodile fish, Pygmy sea horse and Tasselled Wobbegongs, Epaulette and Leopard Sharks. The waters here are moderate in visibility but excellent for close-up photography. The Golden Dawn is an 80-foot-long, 80-ton motor vessel carrying a crew of 7 and accommodations for 12 passengers. It has fully air conditioned cabins, some with ensuites. Because of the diversity of dive locations, the Golden Dawn has two rigid hull inflatables. Indo Cruises is proud to introduce our flagship, the MSY Seahorse liveaboard, a Pinisi rigged Sulawesi schooner offering sailing charters and liveaboard scuba diving trips to East Indonesia. Built and completed in 2004 the MSY Seahorse offers a level of luxury and safety not found on most liveaboard dive charter sailing yachts in Indonesia. A t 33 meters long and 8.5 meters wide, the Seahorse is a majestic and spacious vessel, accommodating up to 16 guests attended by 12 crew. All of our spacious cabins have individually controlled air-conditioning and private en-suite bathrooms with hot water. The classic beauty of the MSY Seahorse combines traditional craftsmanship with all modern conveniences and safety features providing charming comfort in the remotest waters of Indonesia. Our dive travel routes include Komodo, Raja Ampat, RajaAmpat - Banda Sea, Raja Ampat - Ttriton Bay, Banda Sea - Triton Bay and Derawan. Jim Abernethy's Scuba Adventures offers a comfortable and intimate diving experiencein the Bahamas about the M/V Shear Water, a USCG and Bahamas inspected 65-foot liveaboard vessel. The boat offers three air-conditioned cabins with two beds each, plus another four beds in the v-berth. There are two bathrooms with hot-water showers and a full-service gallery. Jim Abernethy has been in the diving business in Palm Beach County, Florida, as a charter boat operator and scuba instructor since 1981. He expanded in 1999 by offering liveaboard diving in the Bahamas. Centered mainly in the north of the country, Manthiri Liveaboard Diving tours, the fruit of years of experience and new discoveries, offer the best combination of dive sites, given the time of the year. Our tours are mainly of 10 day, 7 day and 5 day duration. For those who prefer 10 days or longer charters, they can combine two consecutive short tours. The tours are designed for whale shark and rich fish-life sightings year-round with schooling mantas thrown in June to October. While we do not guarantee the sightings of the big pelagics, the chance of encountering them is very high, indeed. We also offer a special tour covering the southernmost atolls of Maldives, Huvadhoo and Addu. These remote atolls, little visited by tourists, offer colorful coral reefs. The channels abound with sharks. We recommend tours of minimum 10 days of duration. The best time for a south tour is mid February to mid April. The 85-foot (25-meter) MV Manthiri liveaboard is custom designed for dive cruises and heavily built of fine tropical timber. The vessel's wide beam of 25 foot (7.6 metre) contributes towards a stable hull and spacious cabins accommodating up to 12 divers in four twins and two doubles with queen size beds. Built of steel and with a cruising speed of 12.5 knots, the Galapagos Master is set to be the most eco-friendly, dive liveaboard in the Galapagos Islands. She has 9 well-appointed modern cabins, a spacious interior and generous outside space for relaxation and dive gear preparation. Our experienced crew of 10 is waiting to welcome you aboard and show you the best of the Galapagos, both underwater and on land. On a typical day aboard the Galapagos Master, we offer up to 4 day dives, however, the 4th day dive may be substituted for a night dive when the boat is anchored within a sheltered cove. A 7-night itinerary provides between 18-20 dives, while during our 10-night itineraries, up to 30 dives will be possible. Diving in the Galapagos can be challenging, even for the experienced diver. At many sites currents can be strong and visibility may diminish due to currents and an influx of nutrients. We highly recommend our guests have training beyond beginner level and a minimum experience of 50 dives, preferably in similar conditions. Dive the Fiji Islands' finest coral reefs and fish-filled channels. Swim alongside humpback whales in Tonga, explore World War II shipwrecks in Vanuatu or discover Kiribati's truly wild and unexplored Phoenix Archipelago. From manta rays to mantis shrimp, dolphins to dartfish, or voracious sharks to vibrant soft corals, NAI'A found Fiji's ultimate dive sites! Experience the diversity and drama of pristine South Pacific coral reefs at their most colorful and lavish. Enjoy charming Fijian and Pacific cultures during the vacation of your dreams from the comfort of Fiji's premier live aboard diving vessel and her famously friendly crew. The 120-foot NAI'A motor/sailer has set new standards of live-aboard diving luxury in every way, especially in comfort and service. Designed by renowned marine architect, W. de Vries Lentsch, and built by skilled Dutch craftsmen, NAI'A was completely refitted in 1993 and again in 2000 with the latest technology and facilities specific to the needs discerning dive travelers. 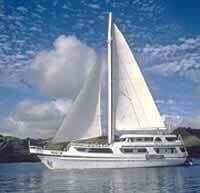 NAI'A sports accommodations for 18 passengers in 9 spacious, air-conditioned staterooms with private ensuite heads. Our Alaska and British Columbia adventures combine the best cold water diving in the world with spectacular scenery and a journey far off the beaten path of larger cruise ships. Other dive destinations include the California Channel Islands, Clipperton Atoll and Sea of Cortez. All of our trips offer world class luxury liveaboard diving and a friendly professional crew dedicated to excellence in guest services on a SOLAS certified Canadian flag diveboat. On our Alaskan journey, you will be able to see calving glaciers from very close up. And you will be able to kayak through the ice fields or even climb onto an iceberg or just watch everything unfold from a deck chair or our hot tub. If the conditions permit, divers may even be able to scuba dive under the icebergs as well. The lushness and density of invertebrate life in the pristine and sheltered waters of British Columbia is amazing. The octopus and wolfeel encounters are legendary. The scenery topsides is spectacular as is the wall and drift diving. Our Port Hardy and Vancouver Island charters are perfect for serious divers and photographers. Discovering one of the world’s premier scuba diving destinations onboard the luxurious Ocean Divine is a truly unforgettable experience. You will have a 5-star services, finest cuisine with 2 chefs and a spa for massage treatments. The owners David & Ga�lle from France are on board all year long to take care of their guests. Ocean Divine has operating in the Maldives since 2006. Our 7-day or 10-day diving tour will have you up close and personal with thousands of unique and unspoiled dive sites. You'll be diving with manta rays, turtles, exotic fish and whale sharks, or simply exploring breathtaking reef passes and coral formations. Accommodation consists of seven individually climate-controlled cabins complete with queen size bed, with well appointed ensuite bathroom. Each cabin is equipped with a plasma screen and DVD player. The Ocean Hunter I is a 60-foot/19-meter steel motorsailer exclusively designed for up to 6 divers or guests. It is very comfortable, stable and user friendly. Ocean Hunter III is a 96-foott/29-meter former research vessel luxuriously designed to a very high specification for up to 16 divers to travel the waters of Palau and the Western Pacific. The Ocean Hunter I was designed by divers, for divers. Unlimited diving is conducted off a spacious diving platform at the stern of the boat and hardly ever off a chaseboat (so you can climb right back onto the boat when you're done and take a warm freshwater shower!). Ocean Hunter I has three cabins with private bath and a/c, and accommodates up to 6 guests, which means uncrowded reefs, ease of entry into the water, personal attention and maximized bottom time. Furthermore, the vessel is designed for professional underwater photography, with a big working area and more than 60 electrical outlets (110 and 220 volt), extra storage space, and E-6 processing available overnight. Ocean Hunter III has 3 standard cabins, 3 deluxe cabins and 2 master staterooms all with private bath and a/c, and accommodates up to 16 guests with personal attention and plenty of space. There is a large dining room and a comfortable salon with sofas and an entertainment system. Furthermore, the vessel is designed for professional underwater photography, TV and Film production, with a sizeable working area, 110, 220 and 415 volt electrical outlets, and lots of extra storage space. 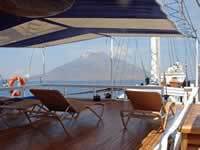 The Ocean Rover is a 100-foot liveaboard based in Manado in North Sulawesi, Indonesia. The Ocean Rover was built in 2000 in Thailand as a comfortable, safe and solid liveaboard dive boat that would offer optimal ease of operations for both her passengers and her crew. The Ocean Rover has eight private cabins with en suite bathrooms and individually controlled air conditioning. It can hold a maximum of 16 passengers and 12 crew members. Ocean Rover's departure point in Manado is the deep-sea port of Bitung in the Lembeh Straits. Each cruise will start and finish with a full day of diving in this location of choice for underwater photographers in search of unique macro subjects. Our divers will also spend time enjoying the world-class diving around Bunaken National Marine Park and Bangka Island. Here divers will encounter spectacular walls and reefs of hard and soft corals. Ocean Rover then journeys further north to a chain of volcanic islands, the Sangihe Archipelago: dozens of islands, some of which are over fifteen hundred meters high and densely covered by coconut palms. This area has some of the deepest and clearest water on the planet. Some of the highlights include an underwater lava flow, a natural hot spring jacuzzi and a dive at Mahangatang, an underwater volcano which releases silver bubbles into the sea, an unforgettable sight. Conditions permitting, we also do a spectacular pinnacle dive at Para Island. Raja Ampat is in the northwestern tip of Indonesia’s West Papua Province. The cruises visit the best sites of Raja Ampat. Diving here means diving with current, for that reason we have to remain flexible because if the current, which will be check regularly by the dive guides, is too strong we will move to another location. The next dive site is waiting just around the corner! The biodiversity of Raja Ampat is unique. In this archipelago are recorded more than 1000 species of reef fishes, more than 700 molluscs and more than 560 species of hard corals, which is more than 75 percent of all know hard corals worldwide. More than 4.6 million hectares of more or less untouched underwater areas are waiting with mangroves, colourful coral gardens, deep walls, huge schools of fish, manta rays, sharks, as well as nudibranchs and critters. The Odyssey is a 132-foot liveaboard based in Weno, Chuuk, in the Federated States of Micronesia. Chuuk, also known as Truk, is in Micronesia's central Caroline Islands. The Odyssey has amenities consistent with the world's top liveaboards. It has six staterooms (14' x 8') with either king size or 2 twin beds; two private single staterooms (11' x 6'); and one stateroom (10' x 9') with a double/twin bunk. ALL staterooms have private ensuite facilities, air-conditioning controls, and are carpeted. Carpeted and air-conditioned throughout the vessel. Large dining area with full commercial galle. A separate entertainment lounge with TV, VCR (PAL & NTSC), stereo, library, large slide table, and bar. The Odyssey offers fabulous diving amongst the ghost fleet of Truk Lagoon. There are fifteen commonly visited Japanese ships and airplanes on the Odyssey's weekly itinerary as well as outer reef dive sites outside the Lagoon. Some folks think Truk Lagoon diving is always very deep. Not true, dive sites range in depth from 0-200. All the wrecks have lush coral growth, marine life and photographic opportunities within recreational SCUBA limits. Advanced certification is required for the deeper wrecks. The 32-metre S.M.Y. Ondina is a classical wooden buginese schooner sailing the inner seas of Indonesia. Sailing aboard the S.M.Y. Ondina you will have the opportunity to explore the most exotic and remote islands of this unique country in comfort and luxury. Built with teak and tropical woods, the Ondina is outfitted with air-conditioned cabins and dining hall. The boat was built by divers for divers to be spacious and majestic, powerful and safe. Cruising on MV Orion is the ideal way to discover the magic that surrounds the Maldives. With 26 atolls consisting of outer and inner reefs, the Maldives is one of the most diverse scuba diving destinations in the world. The 135-foot long MV Orion has 12 guest rooms, finished with the ambiance of a Maldivian Resort. Every room has double/twin beds and beautifully tiled bathrooms. All of the rooms have en suite toilet and shower facilities. On a typical trip, the Orion anchors at night and cruises only for a few hours during the day, enough to discover real cast-away desert islands, unblemished inhabited islands and remarkable dive spots. Passengers are usually a good international mix of young and old, divers and non-divers.Meals are buffets with breakfast cooked to order, lunch and dinner with soup, salad, fruits and a choice of main courses. 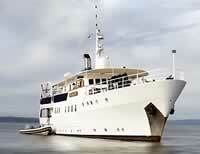 The MV Pelagian is a 115-foot elegant, world-ranging motor yacht based in Wakatobi, Indonesia. The Pelagian is air-conditioned throughout and offers en-suite accommodation (private bathrooms) in five cabins, ranging from the standard cabins up to the master suite, for up to 10 guests. The Pelagian's master stateroom is probably the largest live aboard cabin available in any dive liveaboard in the region today. It is located at the center of the boat, on the main deck. The ensuite bathroom is spacious and offers a separate shower cabin, a long vanity with a huge adjustable mirror and, of course, a WC. The cabin has one full-size queen bed with ample space for two. It also has a full cabin-length shelf on the port side for cameras, gear etc. A sofa and lounge chair is located right next to the entertainment center that has a stereo, DVD player and a good-sized TV. The Indo-Pacific region is considered a biodiversity hot spot, benefiting from the currents and nutrients transported between the Pacific and Indian Oceans. Within that area, the Wakatobi region is near the epicenter of coral reef biodiversity. The hundreds of kilometers of reef structure in the Wakatobi National Marine Park provide every imaginable marine animal, including whales, dolphins, sharks, rays, tunas, barracudas, marlin and more. For photographers, this means wide-angle, normal and macro opportunities abound. With awesome visibility and breath-taking soft corals, the Red Sea is one of the most popular dive destinations in the world. There are over one thousand species of fish in the Red Sea, 20 percent of which can be found nowhere else in the world. It is hard to believe that where the Egyptian desert sands end, a marine paradise begins. Ironically, the desert climate has created an ideal setting for divers. The Red Sea Aggressor operates from the yacht marina of Port Ghalib. Port Ghalib is a beautiful and safe community that includes three resorts (Crown Plaza Sahara Sands, Intercontinental Hotel and Marina Lodge) with many restaurants and shops. With clear, deep blue waters, abundant sea life, white sand beaches and inspiring vistas, the Sea of Cortez - known as the Gulf of California - is a breathtaking destination for amazing fishing, scuba diving, snorkeling, sailing, boating, and exploring diverse marine creatures. Dive and interact with the friendliest giant mantas in the world in Socorro, where these giants choose to interact with divers. In Baja, you'll observe gray whales, pilot whales, sperm whales, humpback whales and dolphins. No telling what you will find in the Baja California. The Rocio Del Mar has 10 comfortable guest staterooms on two decks. All have private bathrooms with hot shower stalls, western style toilets, lavatories, and above height window. Each cabin is carpeted and air-conditioned. There are room length windows with privacy curtains and convenient gear and clothes storage drawers beneath the beds. The MSY Seven Seas is a 33-meter, traditional Buginese Schooner. Custom-designed to accommodate up to 16 guests in spacious comfort over three decks, she is perfect for both diving and relaxation. The Seven Seas has 8 state rooms with en-suite bathrooms. Four rooms host royal size double beds, 2 rooms host a large size single and regular size single, and the last 2 host regular size twin bunks. The galley is fitted with the latest in culinary kits and chef welcomes guests who want to join in and prepare special snacks or meals. The Seven Seas features the latest diving and safety equipment, Nitrox, 3 speedboats and satellite communication, all of which means that we can sail where we want in comfort and in confidence. Our dive guides share their knowledge of marine life and the local area as well as guiding you to the best dive sites. 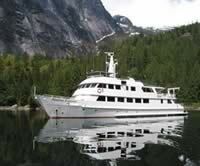 The Solmar V is a 112' luxury live-aboard dive vessel based in Cabo San Lucas, Mexico since 1992. The Solmar V is a true four-season live-aboard that takes advantage of weather patterns to provide optimal diving year-round. We journey 250 miles south of Los Cabos into the eastern Pacific Ocean to the Revillagigedos Islands — more commonly known as the Socorro Islands — to dance with the Giant Pacific manta ray, cavort with dolphins, dodge seven different species of sharks and thrill to an occasional lucky interaction with the migrating humpback whale population. The Sea of Cortez is one of the youngest and most fertile seas on earth, containing over 850 species of reef fish, as well as the famous flying mobulas and an assortment of schooling pelagics and tropicals. We've been diving the Sea of Cortez for over 25 years. In August and September, we are based in Ensenada, Mexico, and follow the ultimate apex predator to Guadalupe Island, 180 miles offshore. This is rapidly becoming the world's best location to dive in custom-built shark cages with great white sharks. The interior of the Solmar V is outfitted in brass, rich mahogany, granite table tops and is completely carpeted. The salon comfortably seats all of our guests and offers a large-screen HDTV, VCR, DVD player and stereo system. Each mahogany-detailed stateroom features air conditioning with individual controls, a private head, sink and shower and a TV/DVD player for your enjoyment. The 115-foot Thailand Aggressor, built to U.S. Coast Guard standards, can accommodate up to 16 passengers in eight staterooms, all independently air conditioned. Sailing from three different ports, the Thailand Aggressor offers 7-night itineraries to the North Andaman Sea, the South Andaman Sea and Myanmar. For divers, the true treasures of the Andaman Sea are found at famous sites such as the Similan Islands, Phi Phi Islands, Richelieu Rock, Hin Daeng, Koh Raja and Shark Point, where the warm, clear water draws large schools of tropical fish, manta rays, and the awe-inspiring whale shark. The wealth of aquatic life will delight underwater photographers and marine naturalists when scuba diving Thailand. Tony Backhurst Scuba Travel operates up to 6 boats a week out of Egypt all year round and also have liveaboards in the Maldives, Sudan, Djibouti and Wakataboi. The Red Sea is world renowned for the unparalleled quality and quantity of diving that you will find there. Our luxurious boats in the Northern Red Sea provide the perfect platform for exploring the wonderful dive sites that have made this area so famous. Stunning wall diving, a huge variety of fish and corals, and some of the best wrecks on the planet. The region spans from the Sinai peninsular, stretching across the Gulf of Suez and right up to the North of Hurghada. The jagged mountains of the Sinai seem to cling to the coastline. Their lofty peaks mirror the dramatic drop-offs underwater. This is where the streaming currents of the Gulf of Suez and the Gulf of Aqaba meet. The Maldives were voted Diver Destination of the Year, 2007 by readers of Diver Magazine and one quick look at what is on offer here quickly reveals why. The Maldives are made up of a series of atolls and islands which, barely scraping above sea level, give access to year round sun shine, white sandy beaches and tropical diving that will blow you away. The relaxed atmosphere of atoll life mean you can give in to the temptations of great diving and good living. Here the emphasis is on enjoying a fast drift dive or watching great manta as they come in to be cleaned. Whalesharks also frequent the area and grey reef shark sightings are common whatever the season. Undersea Hunter Inc. is based in Costa Rica and operates dive expeditions on board the research vessels �Sea Hunter� and �Undersea Hunter." Since 1990, the company has focused these voyages to the remote Cocos Island, located some 300 nautical miles off the Pacific coast of Costa Rica. The vessels also regularly visit the equally exotic Colombian Island of Malpelo. Undersea Hunters Inc. has oriented its live-aboard operations not only toward experienced divers and adventurous explorers but also toward the support of major underwater film projects. Its ultimate goal is to bring producers and film production teams to the most remote and isolated areas of the hydrosphere. MV Undersea Hunter is a 90-foot-long vessel with a 24-foot beam. It accommodates up to 14 guests in its seven guest cabins. The guest cabins each have heads and showers and individual AC controls. MV Sea Hunter is 115-foot-long vessel, with a 26-foot beam. It has accommodations for 18 guests in six double cabins and two triple cabins. All guest cabins have heads and showers and are air conditioned. The 32-meter MV Ambia, based in Jakarta, Indonesia, has been operating since July 2012, offering dive trips to Komodo, Raja Ampat and the Banda Sea. Traditionally built from Iron wood and other tropical hard wood, her design is especially conceived as a dive cruise boat. She receives up to 16 divers in absolute comfort. Her 8 cabins have individually controlled air conditioned, private bathroom with hot water. An inside lounge and restaurant, large shadow deck areas and a sun deck complete the common parts. Photographers enjoy a dedicated room for the maintenance and preparation of their cameras, as well as a large screen in the lounge to share pictures and videos. At the rear of the deck, a large dive deck extended by a platform offers an easy and direct access to the three dive tenders. The 60-meter MSY Waow, based in Denpasar, Bali, Indonesia, is the ultimate dive ship, cruising throughout Indonesia. It offers pristine diving, luxury accomodation and premium service for passionate divers. The MSY Waow has 9 cabins, catering for a guest list of 18 passengers. Each of the cabins is luxurious and spacious. They all have private bathrooms with separate shower, separate WC, air conditioning, desk, entertainment system and LED lighting. The 36-meter, steel-hulled, twin-engined MV White Manta was launched in 2011 and is operated by White Manta Diving, based in Singapore. The MV White Manta sleeps 24 guests in 12 cabins: 8 x En-suite (double/ twin/ triple share) and 4 x Standard (twin share with wash basin, shared bathrooms). It has two large dinghies for diving and a 650 square foot dive deck/dive platform, with camera table and amber fresh water wash tank. Thailand is one of the most popular destinations in the world for scuba-diving - and for good reason. It has a well developed tourist industry and an established diving industry. Divers are offered a wide range of dive locations in this tropical paradise. Thailand�s diving locations are concentrated along the southern peninsula and it is possible to dive on both the east and the west coasts. When the seasonal monsoons affect one coast, the other side usually has great diving conditions. As a result, it is possible to dive in Thailand all year round. 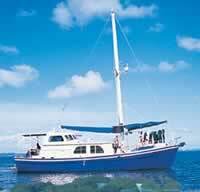 Worldwide Dive And Sail offers liveaboard diving and sailing in Asia and the Pacific. A fleet of five sailing yachts offers liveaboard dive holidays in Thailand, Indonesia, the Maldives, India and the Philippines, Palau, Malaysia and Timor-Leste. The 40-metre S/Y Philippine Siren is a luxury liveaboard diving in the Philippines, including Cebu, Dauin,Tubbataha, Apo reefs, Coron Wrecks and Anilao. Built by divers for divers, the boat is a traditional �gaft rigged Phinisi� handcrafted from ironwood and teak, with room for up to 16 guests. It holds up to 16 guests aboard each trip. 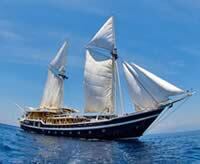 The 40-metre S/Y Indo Siren is a luxury liveaboard diving Indonesia, including Raja Ampat, Komodo & the Banda Sea. She has the same specifications as her sister, the S/Y Philippine Siren. The 40-metre S/Y Palau Siren is a luxury liveaboard diving Palau year-round. She has the same specifications as her sisters, the S/Y Philippine Siren and the S/Y Indo Siren. Copyright © 2003-07 Dive Travel Services. All rights reserved.